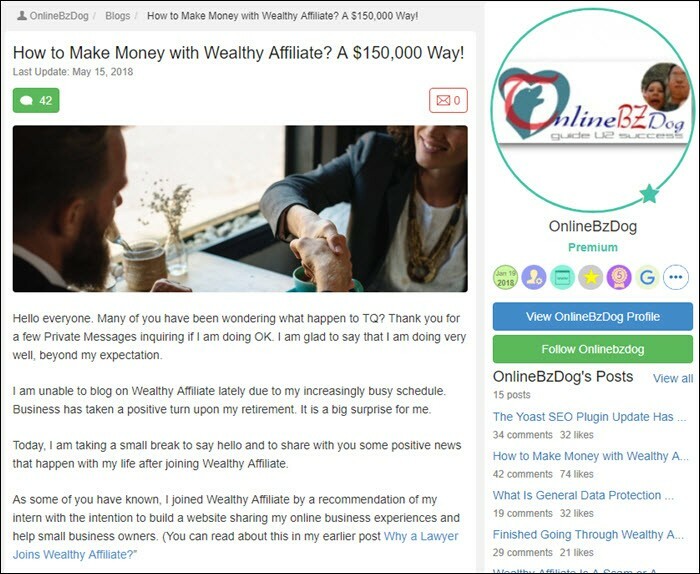 There are a ton of places out there that claim to help you make money online, and Wealthy Affiliate is one of the most popular and most recommended training courses to learn affiliate marketing. But are people actually making money with the program or are those affiliates just promoting them to make a commission? What's with all the hype? 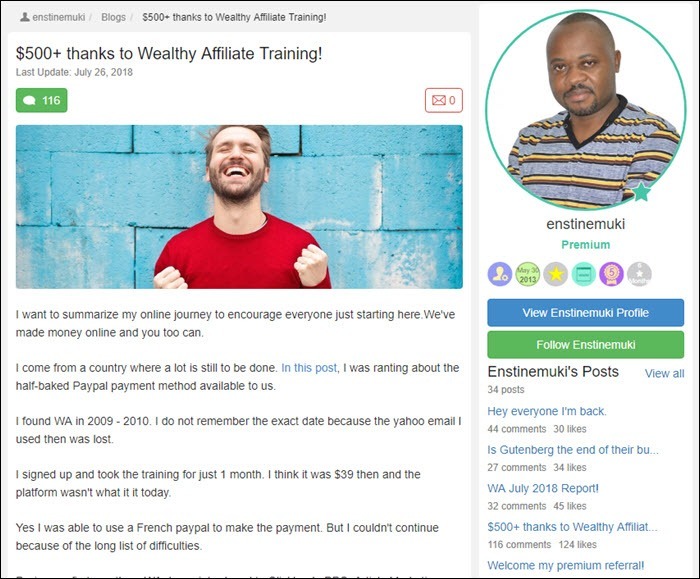 I can tell you as a decade-long member of the community that I have made a significant amount of money online thanks to their affiliate training, and I'm not the only one. I've collected 46 different examples of Wealthy Affiliate results that should convince you to join right now. These examples are just ones that I thought were interesting, and are also from a variety of different people in a wide variety of niches. I don't know everyone's niche, and not everyone shares their website, but if you click the links on this page some people do mention what niches they are in. There are many examples where I saw someone post about their first $100 day or even a $1000 day. Making $10,000 month is a big milestone too. Don't forget that making your first organic sale, even if it's just $5, it a big accomplishment too. For many folks, that happens in the first months of starting their affiliate website, and then the clouds part to reveal a maniacal work ethic and clear vision of a future of working online. So can you get results with Wealthy Affiliate? Absolutely. There's nothing special about the people in this list(sorry guys! ), and there's certainly nothing special about myself. We all enrolled in the training, did the lessons, and worked hard on our websites every day. You can create your own account, try the first 10 lessons for free, and see what you think. 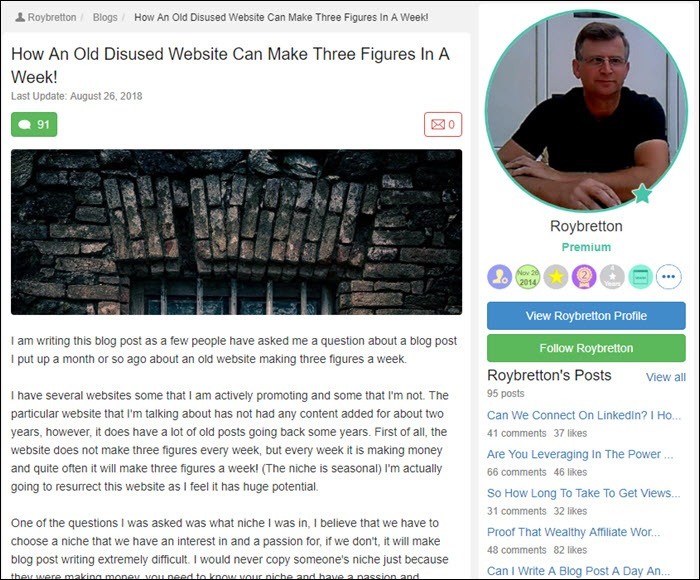 @RD40 joined WA in 2016, and has been rockin' his affiliate site since then. 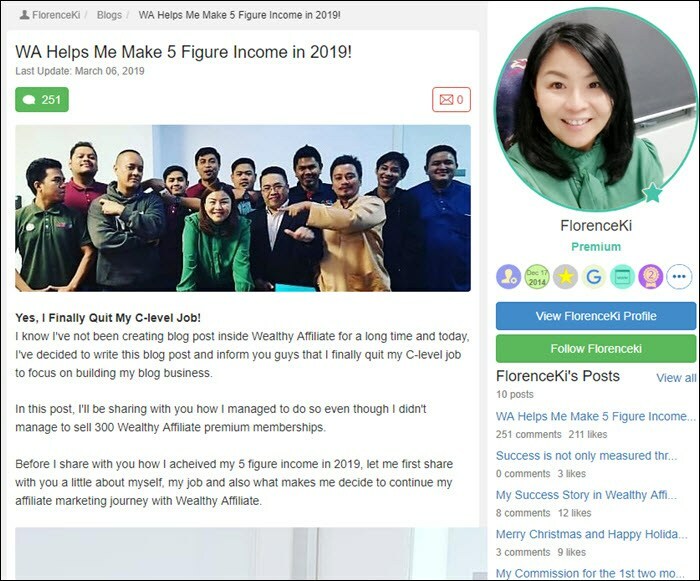 As of 2018, he was officially a “six figure earner”, which is a huge milestone for many people wanting to work online. His niche was in the health and fitness industry, which you may know is a very evergreen niche (that means it'll never go out of style). From the 25th to the 31st of December he earned an amazing $17,175 and totaled a whopping $110k+ for the year. Wow! The funny part was that he remembered setting his goal as earning just $1,000 per month, so it was pretty exciting for him to blow way past that goal. 2. December 2018 – $1,738 Dollars & Growing! @Craigrut has been at WA since mid-2017. 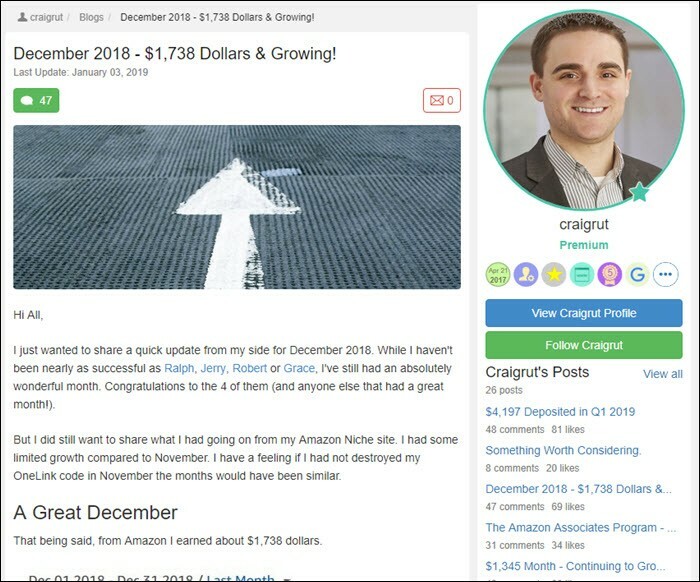 He hit his first $1,000 month in October 2018 by relying on Amazon’s affiliate program. While his growth in November wasn’t as high as he had hoped, his December profits were an impressive $1,738. What’s more, Craig doesn’t rely on any paid advertising. Instead, he focuses on keyword research and driving traffic from Google. He hopes to hit the 5-figure income mark in 2019. This goal is certainly possible if his site continues to grow at its current rate. The travel niche has been a source of success for @Sgregcrx. 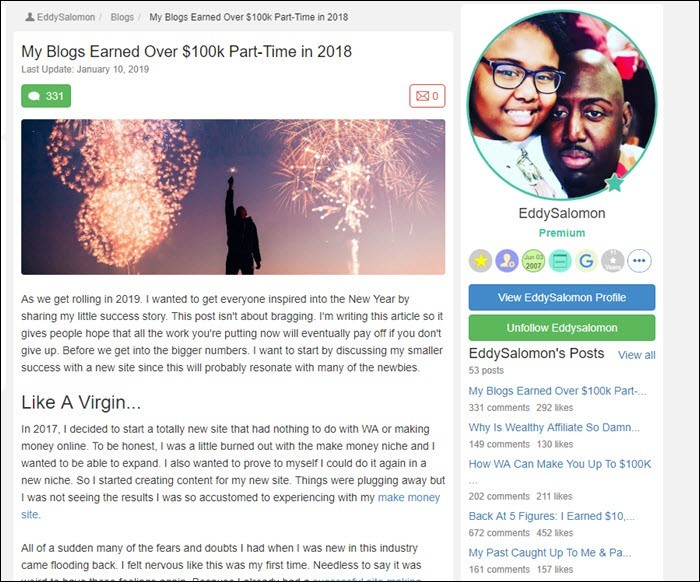 While he saw no income in the first year of his site, he started to see significant growth in 2018, reaching consistent revenue of around $1,000 per month. That made for a total income of roughly $8,000 by the end of 2018. Even more exciting – he has been making this profit with around 200 to 250 hits each day. 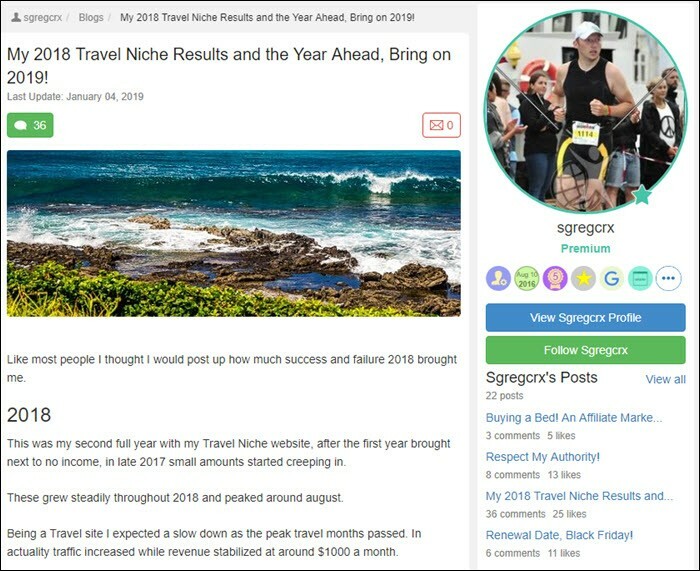 @Sgregcrx is hoping for considerable growth in 2019, perhaps two to three times his current level, if not more. His success is especially relevant, as he is operating in the travel niche. This niche has considerable growth potential due to consistent demand. His experience also shows that there are many different niches that can offer the potential to make money online. @Enstinemuki first joined WA back in 2009 or 2010. He has taken different angles than most affiliate marketers, including buying and selling a PLR book, developing a traffic tool for Twitter, and then selling his site in 2012 for $13,500. He has recently returned to WA after many years away and is excited about getting back into the internet marketing field. In total, @Enstinemuki earned around $500 through WA training. One of the most powerful parts of his experience is that he used the training for much more than traditional affiliate marketing. This highlights the versatility of WA and the sheer amount of information that is offered. Here’s an impressive WA story from @EddySalomon. In 2017, he started a brand new site that wasn’t related to making money online at all. Although Eddy already had success promoting WA on his main site, he found his new site surprisingly challenging, with slow progress. It took until Fall of 2018 for him to see traffic. Once he started to monetize, he made a total of $3,745.08 from the site for 2018. Most of that income wasn’t from sales but from ads. While his total income for the new site was relatively low in 2018, the earnings show significant potential. Eddy predicts substantial growth in 2019 and I’m inclined to agree. As he points out, the new site is just a side project. His main site is earning much more income. 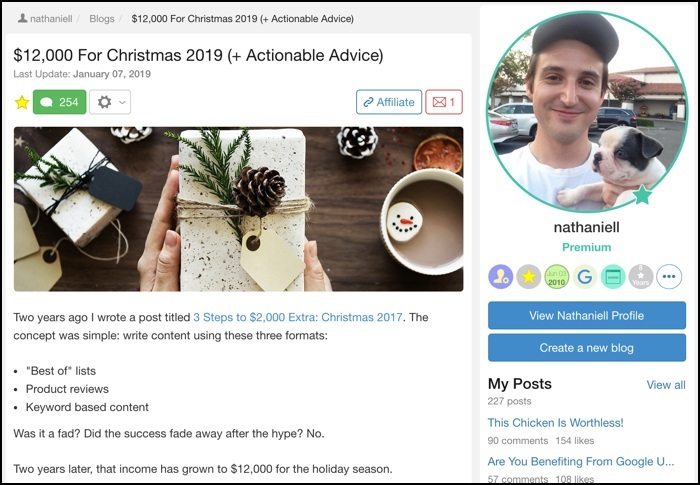 He made more than $100,000 across the two sites in 2018, with income from sales and from ads. 6. Just launched my 2nd ebook. $7,500 in profit in 2 months for the combo. @DebbieGartne has had a different online experience than most. She started blogging in 2010, using her blog to drive traffic to a physical location. It wasn’t till early 2017 that she started trying to monetize her blog. 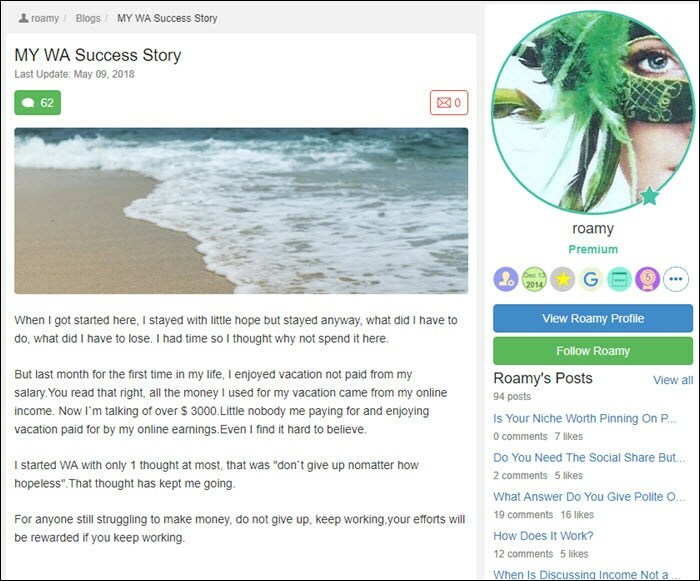 Her success story doesn’t come from this but from an SEO eBook that she developed towards the end of 2017 and a second that she launched later. She took the powerful approach of seeking affiliates herself, who do the marketing work. 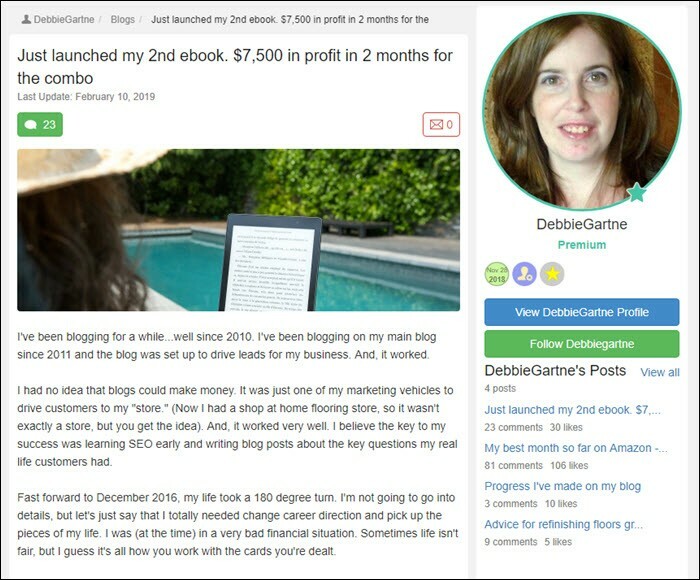 Even after paying out commissions to affiliate and all the fees, Debbie earned an additional $7,500 in profit – within two months! Talk about impressive. This is from a girl with a blog on flooring and eBooks on SEO. 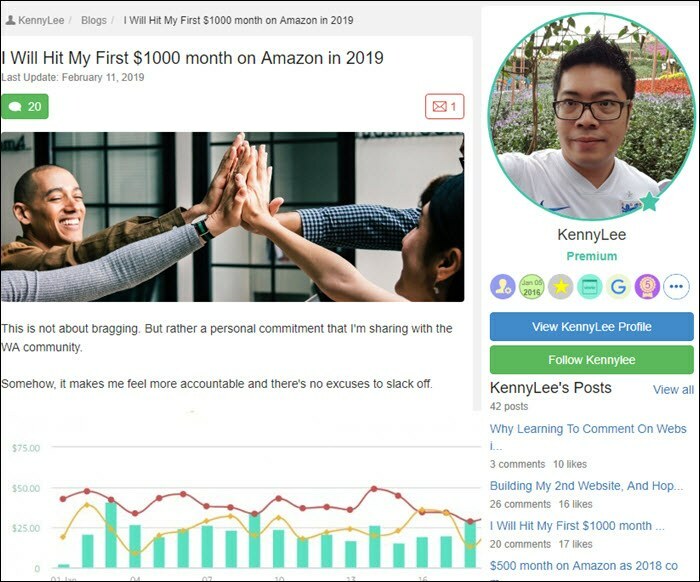 @KennyLee was excited to report earnings of $708.98 from sales on Amazon, along with a $6 bounty. This figure puts him well on track for making his first $1,000 before the end of 2019. His success comes from a site that earned nothing at all a year ago. How’s that for fantastic? As Kenny himself says, “consistency and focus is the key of growth and success”. For those curious, Kenny is operating in the health supplement niche. This is an evergreen niche. Everyone wants to boost their health – and there are plenty of interesting supplements out there to choose from. @FlorenceKi is a successful WA affiliate, working towards the goal of 300 WA premium memberships per year. Her most recent success story is quitting her C-level job, one that was causing her considerable stress and difficulty. She had been working on her blog during this role, without seeing dramatic success. Yet, she had some amazing news when she quit her job. She was offered contracts in the fields of branding and digital marketing. The associated work is directly related to the skills that she has learned at WA. Florence plans to seek success in both directions – through the new career opportunities and through promoting WA. Her dedication is amazing, especially her willingness to work her way through difficult circumstances. 9. Bringing the wife home. 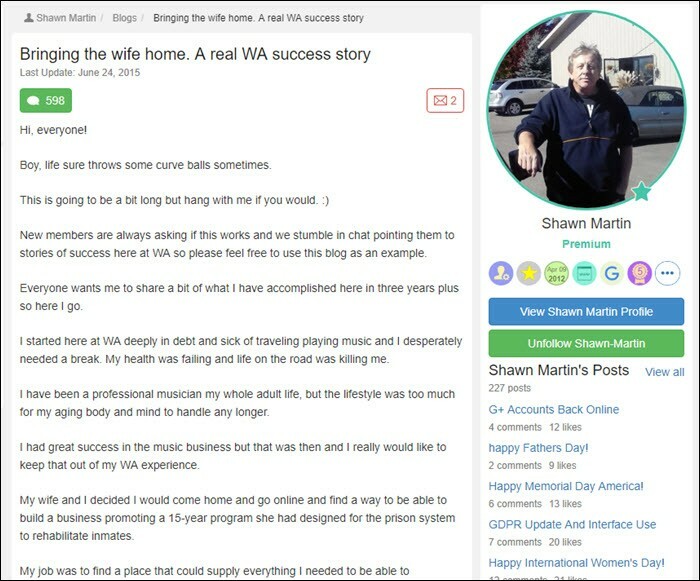 A real WA success story. There are two powerful parts to the success story from @ShawnMartin. The first is his movement from being in debt and poverty to earning a regular income through affiliate marketing. His experience can’t have looked encouraging at the start – as his niche was far too broad and he made almost no money. 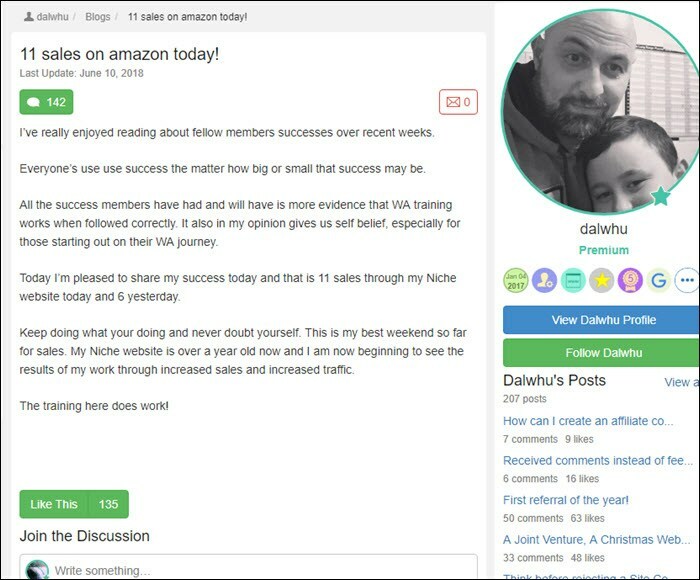 Once he shifted to a new niche (with advice from WA members), he earned $1,400 within a month. The second part is his current success. He has two sites hosted through WA and other sites hosted elsewhere. He has been able to work full-time from home with his wife. That’s an incredible milestone – and he is still progressing! They are now working on a pet project that his wife has designed. It’s an amazing story. It will be amazing to see where Shawn ends up in a few years. 10. 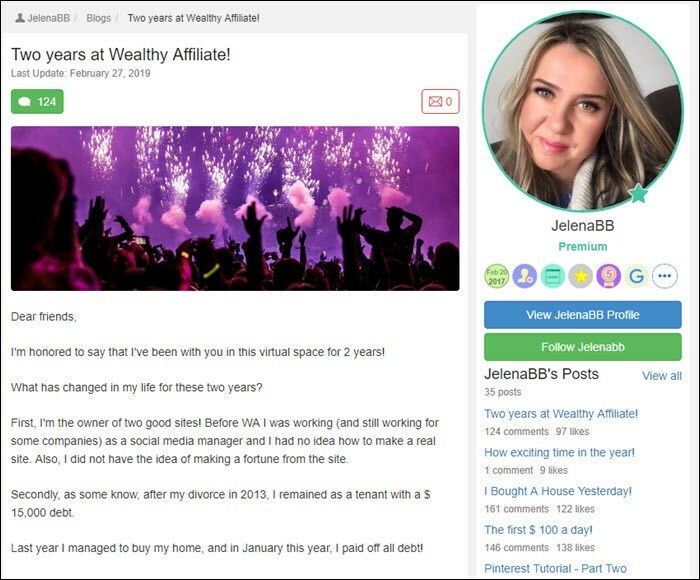 Two years at Wealthy Affiliate! As the title of her post suggests, @JelenaBB has been at WA for two years. Before her WA experience, Jelena was working as a social media manager. Despite this, she had little knowledge about website building, much less how to make money online. In her two years at WA, Jelena has developed not one but two successful websites. That’s not all! She is now doing much better financially than before. She is debt-free and has been able to buy her own home. The success story from @mday849 is certainly an impressive one. 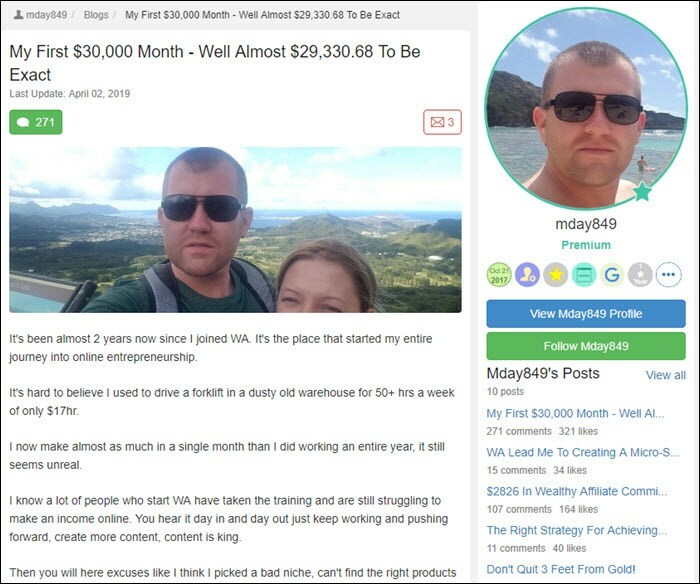 He has been a member of WA for just two years, yet he’s managed to hit almost $30,ooo a month in profit. His story is powerful evidence of how an online business can be a full-time earning machine. He also provides plenty of information about the approaches that he’s taken. His key message is that success takes hard work – and lots of it! He still puts in 8-10 hours daily, for growing his business and learning more. Being creative is important too. 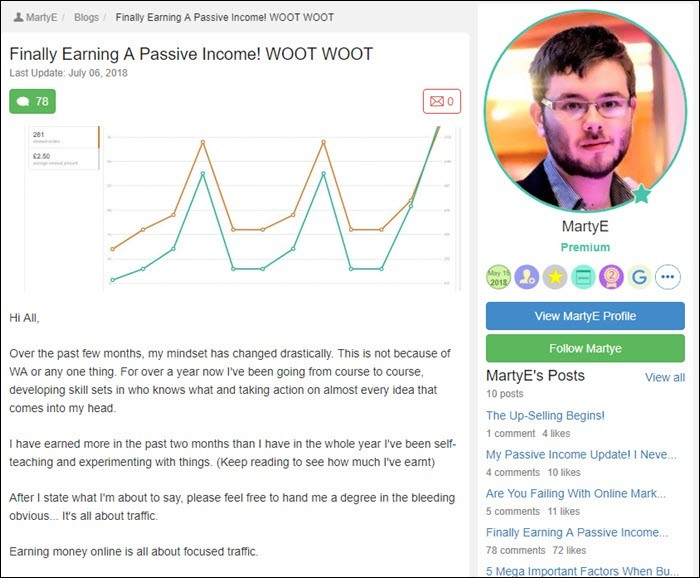 Much of @mday849’s income didn’t come from affiliate marketing. He used a variety of other techniques as well. @JohnMks has a different type of success story to tell. 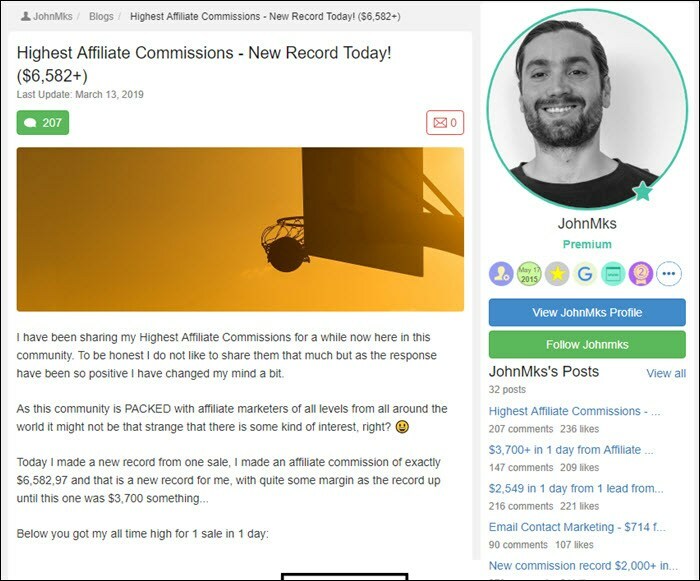 He hit an amazing record, making more than $6,500 in commissions from a single sale. His previous record was around $3,700, which is seriously impressive too. While John never talks about his niche or the products he is selling, high commissions like this certainly aren’t impossible. You often see them from high-ticket items, ones that people are paying thousands of dollars for. His main piece of advice is to never give up. That applies to any niche and is especially important in the beginning. This post comes from @JohnMks as well. This time, he isn’t talking about his overall success. He’s focusing on one specific approach that he uses – email marketing. 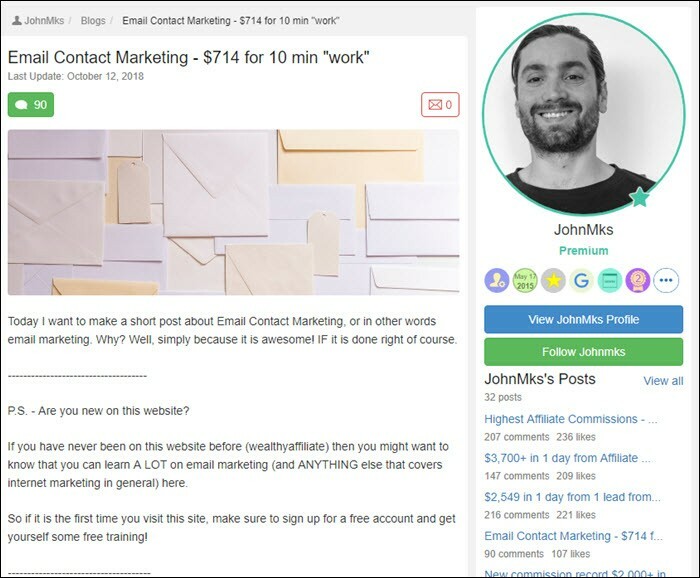 John managed to earn $714 from a single email that he sent, which received 16 clicks. Not too shabby! Email lists like this really are powerful tools. They take time to build, sure, but WA can help you to learn. John’s experience shows that lists do pay off. The approach is also another revenue stream. Having multiple sources of online income is a great way to grow your business and earn in the long-term. 14. Yes I Made it! 6 months in. Hard work Pays off! 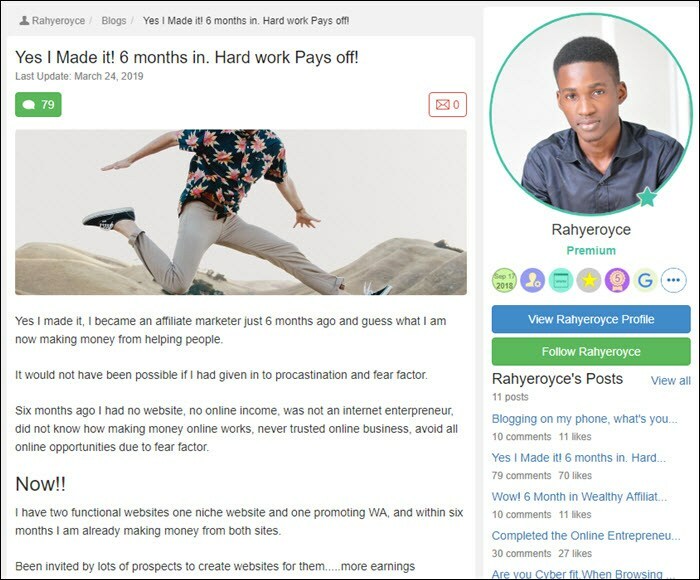 @Rahyeroyce is an affiliate marketing newbie. He’s only been in the field for six months. In that time, he’s managed to build two different affiliate marketing sites. One of them promotes WA itself, the other is a niche site. He’s currently earning from them both. He’s also had plenty of attractive offers to make websites for other people. This type of success shows that you don’t need to be an expert. You can start at a very basic level and still find success. You might even do so within a year like Rahye has. Here’s another affiliate marketer who has found success early on in his sites. In particular, @Dylanrieger hit the $4,550 mark, just seven months after his site went live. That being said, he isn’t a complete beginner. Dylan has been at WA for around 2.5 years, with various successes and failures along the way. It has taken Dylan time to find the right approaches and the right niche to start making consistent money online. His experience shows the importance of persistence – something that he mentions in his post as well. While some people are successful with their first idea, others find that they have to try a few different angles before they find their way. 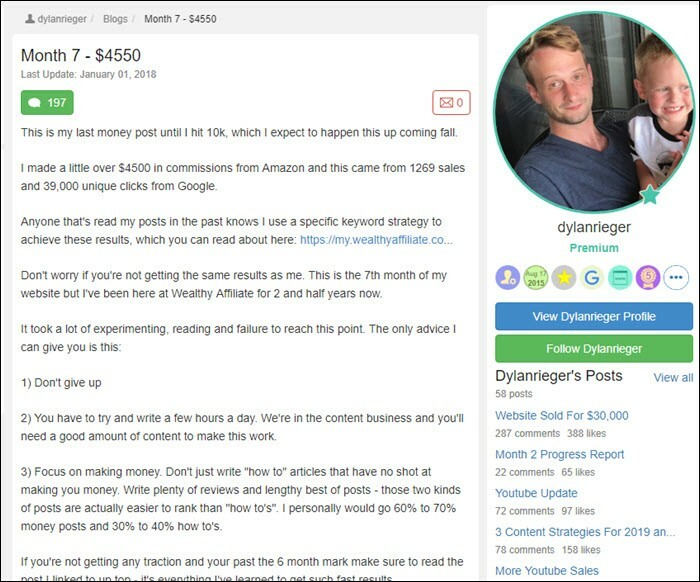 This success story comes from @Dylanrieger as well and was around four months after the previous one. 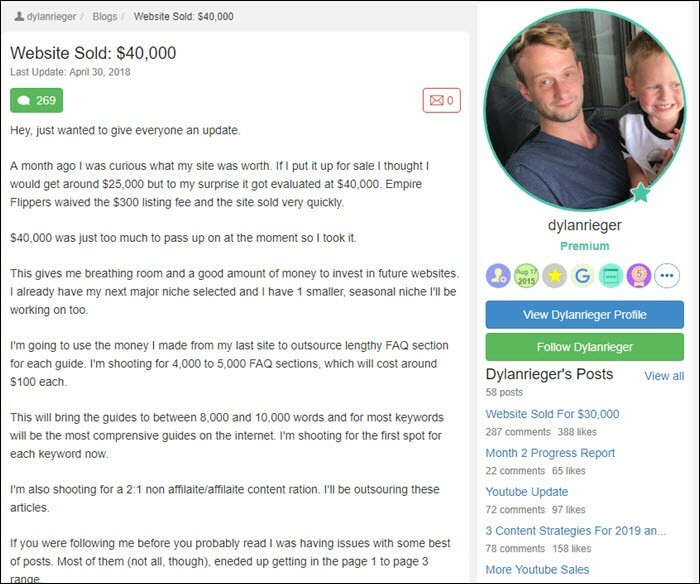 As the title suggests, Dylan managed to sell his site (using Empire Flippers) for $40,000. That money is an incredible achievement in its own right. For Dylan, the sale also acted as a stepping stone. His post highlighted his plans to use the money to outsource content creation for his future websites. This type of financial outlay can be painful in the short-term, but it is a powerful approach for long-term success. The decision is also a clear indication that Dylan is confident in his approaches. In his post, @BrokFTJFH highlights just how much business success can change in a year. 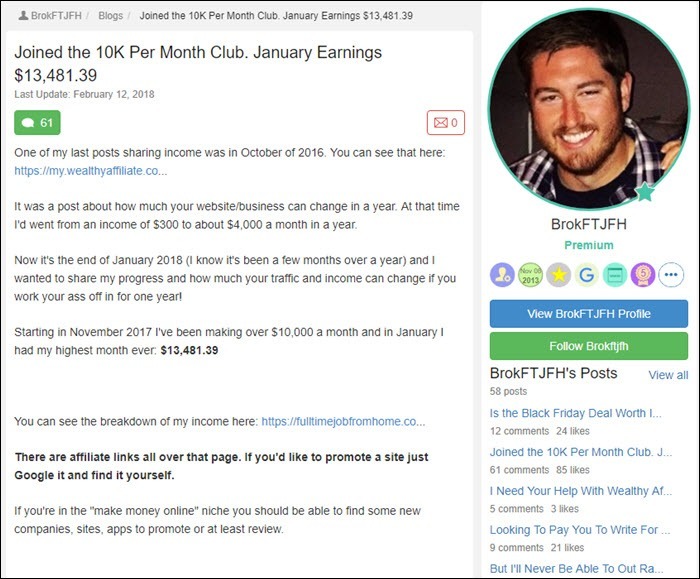 His monthly income went from roughly $300 to $4,000 within a year and then to more than $10,000 per month roughly a year later. These shifts in income are huge – and they’re not unusual. In fact, one of the main reasons that affiliate marketers often don’t succeed is that they give up before they see significant income changes. Brok’s success didn’t end with $10,000 per month either. He reported earnings of almost $13,500 for January 2018, suggesting that his site was continuing to grow and thrive. 18. 1st $1000 month – Wealthy Affiliate success! The success story from @CraigUKTV might not seem as impressive as the previous one, but he has still made amazing progress. 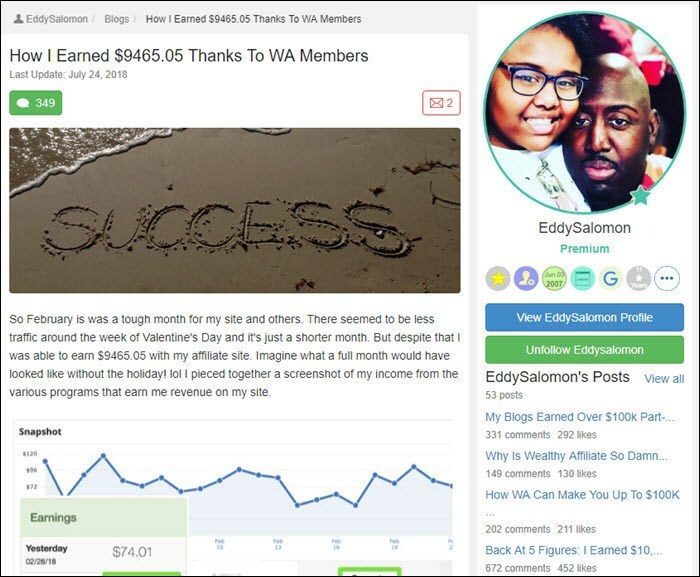 He hit his goal of $1,000 per month in January 2018. This achievement was close to a year and five months after joining WA, which is great going. Craig provides more details than most about his niche. He focuses on TV that is delivered over the internet (IPTV), using IPTV subscriptions, VPN subscriptions, and services like Amazon for revenue. The focus on subscriptions has advantages too, as customers will often be members for many months. When this happens, the affiliate marketer can end up with a passive source of income. 19. How Much A Single Review Post Can Make? Five Figure! The post from @Cena1975 highlights a fantastic point. Sometimes sales success is strongly related to the success of a single post. For some people, like Cena, that post may be unexpected and not one that particularly stood out. However, Cena chose to take advantage of that one post (which had made him an impressive $10,000 or so) and use it as a template. 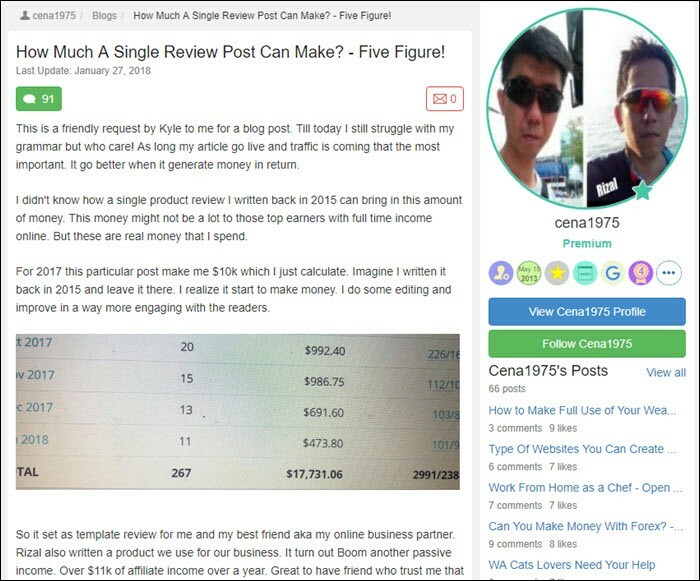 This helped him to create another popular post that became a passive source of income. Cena’s outcomes show that sometimes success comes in unexpected places. You might find that a few of the posts you make are extremely popular, while ones that you poured your heart into never take up in quite the same way. If nothing else, this pattern is a reason to keep working on your business. @Sporkypie has had an interesting experience with her website. Like many beginners, she went through periods of not working much on her site, due to other life commitments. She estimates that she had done around six months of work in the 13 months that her site has been live – resulting in almost 60 articles. She wasn’t looking to sell the blog, but one of her competitors reached out to her with an offer. 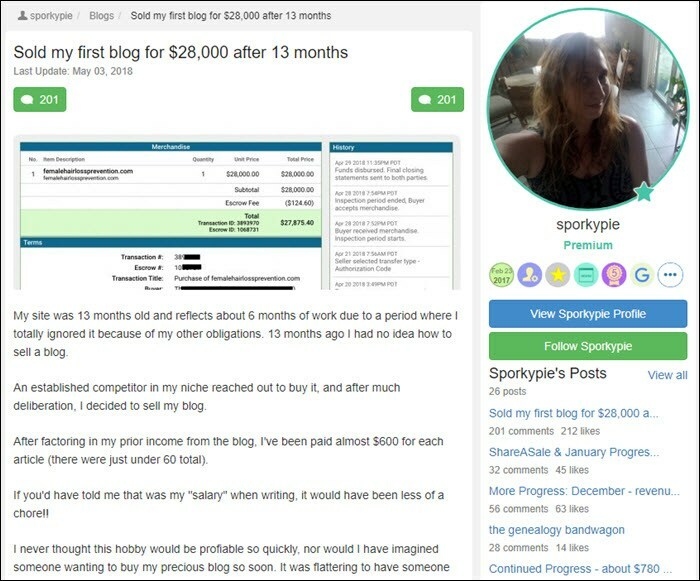 Including previous income and the $28,000 sale price, @Sporkypie estimates that she earned close to $600 per article. That’s an astonishing outcome. She now has some money and experience to keep going in the field. 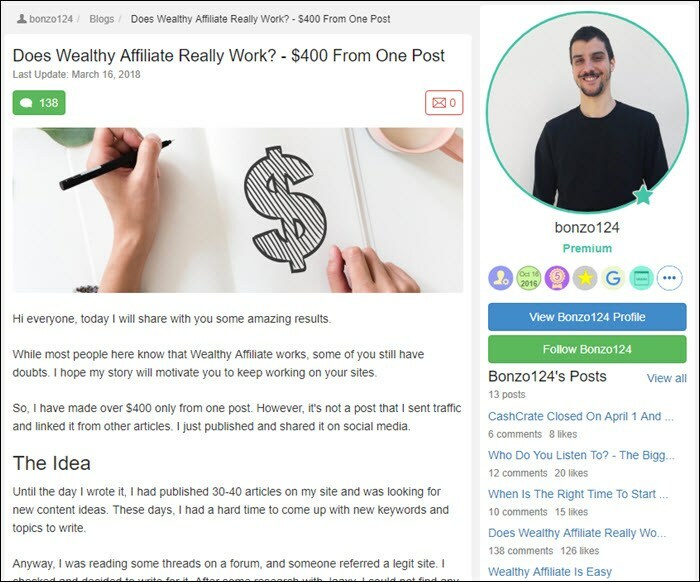 @Bonzo124 is another WA member who shows you can find success from individual posts. He had around 30 to 40 pieces of content on his site at that time. His process for this particular piece wasn’t unusual, although he did manage to find a very good keyword. The post has since ranked in Google and he has earned around $400 in total from the one post. This isn’t the end of the story either. Bonzo mentions that the post converts well. If he is able to drive more traffic to it, then he should be able to raise his income even higher. 22. I got a $650 Sale with $50 monthly recurring! In her success story, @Herinnelson highlights how multiple income methods can be successful. For her, this includes book writing and a web design business. 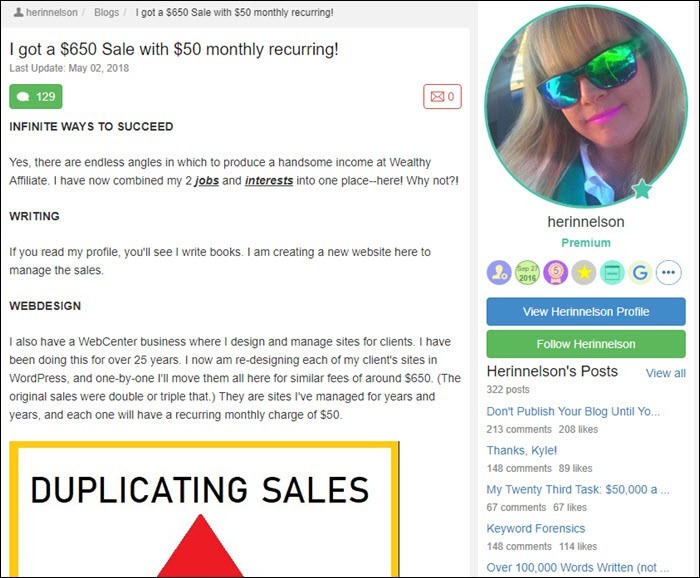 She is taking advantage of the skills that she has learned at Wealthy Affiliate to redesign the websites of her clients and move them to WordPress. She is charging around $650 for the transition, along with $50 per month for management. Based on her title, @Herinnelson has made one such sale, which is exciting news. She also has five other websites through Wealthy Affiliate. Her style shows that you don’t need to stick to the most common techniques. There are plenty of different ways to earn. If you want impressive results, check out @EddySalomon’s success story. He reports being able to earn $9,465.05 in February 2018. That’s despite the fact that February is a shorter month and includes Valentine’s Day. It’s easy to see how a different month could lead to even more income. Another cool thing is that Eddy relies on multiple income sources. His screenshot shows this well, highlighting different totals from various programs. It’s likely that many (if not all) of those income sources will increase with time. 24. It’s Been 2 Years & 2 Months In WA. Finally Quit My Job. Yayyy! @ArjunUllaz has reached a goal that many people dream of. 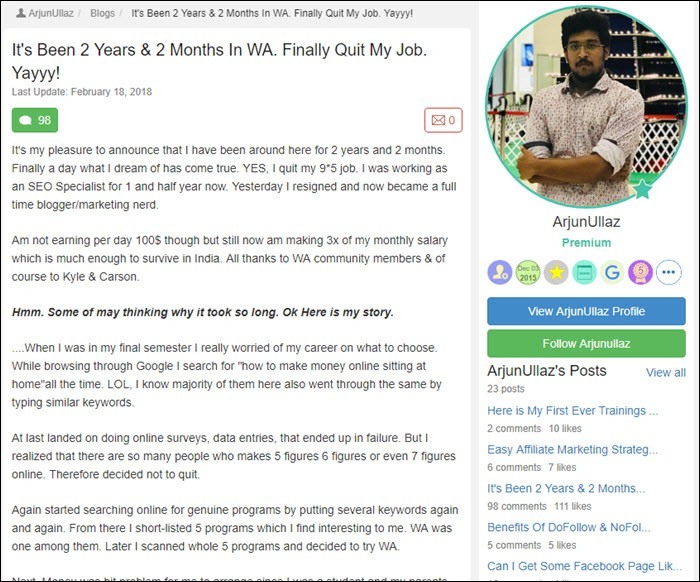 After a little over two years at WA, he’s been able to quit his 9-to-5 job and become a full-time internet marketer. He estimates that he’s earning three times the salary he was receiving at his job, making the decision a smart one. Arjun is likely to see much more growth as time goes on. He now has more time to dedicate to his website, along with a ‘never give up’ mentality. These advantages should take him far. 25. $223.50 Made While In ICU. @Lakbar12 joined WA towards the end of 2017, with barely any previous experience online. She was determined to follow WA training and do her best to make it work for her. She didn’t need to wait long to find success. 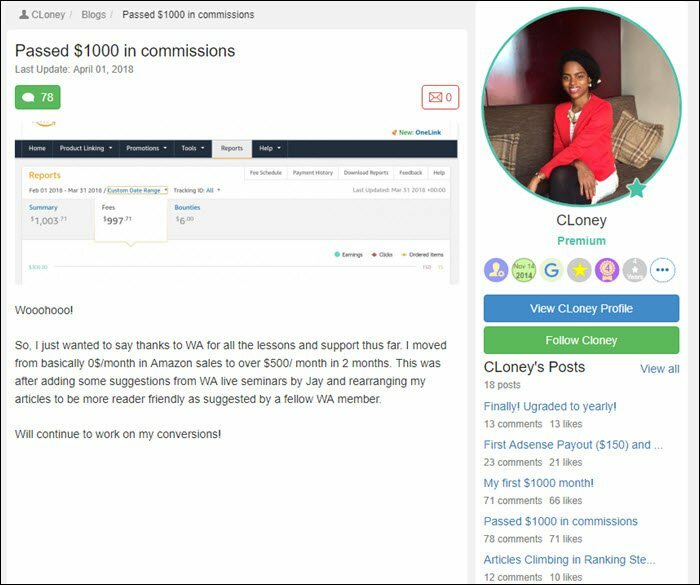 After being a member for around 41 days, she received her first commission of $8 immediately and $167 pending. She received another commission not long after of $223.50. The success came as a surprise. @Lakbar12 even initially thought that one of the emails was an error. That’s often how it happens. Early affiliate sales can seem to appear out of the blue. Some people don’t even notice them initially, as the emails get lost in their inbox. 26. Newbies Pay Attention! $5,195.20 Affiliate Check for June: Thanks WA! @Tmaltz has seen impressive success on WA. 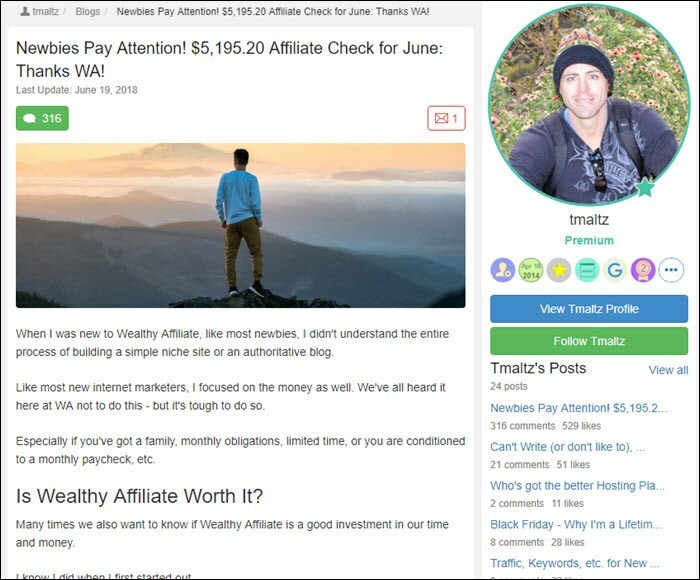 He’s aiming for consistent income of $10,000 a month from affiliate marketing. He’s on track too. In May of 2018, he earned a total of $6,454. 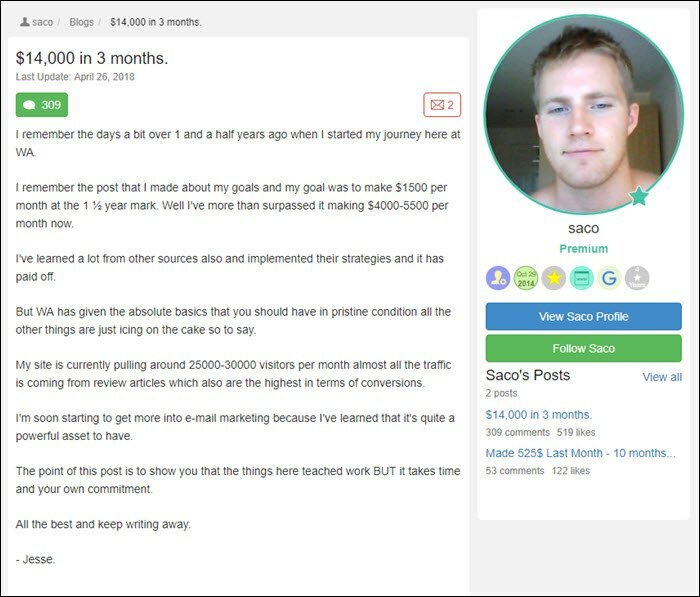 His post estimates that he’ll make just under $8,000 for June. That’s not even the really exciting part. What’s cool is that much of this income is from just two sales – one of which was for an amazing $5,195.20. He also mentions the importance of scaling your business. Doing so is critical for increasing your income in the long-term. 27. 11 sales on amazon today! In his short success story, @Dalwhu talks about how the training from WA really does work. As he points out, even small successes are important. 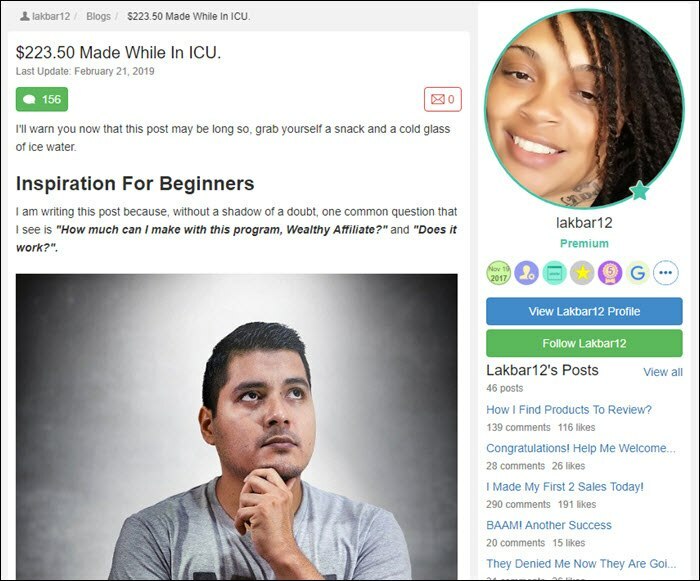 He reports that he made 11 sales through his niche site on the day of posting and six the previous day. These sales are for a site that has been around for a little over a year. This type of success is the beginning of something great. Now that @Dalwhu is starting to see momentum, he can grow on it and make his business even more successful. He even mentions that both sales and traffic are increasing. @Roamy didn’t have much hope when she first started at WA. She simply thought that she had little to lose and plenty of time to spare. Like many WA members, she was wrong in that assumption. In fact, she was able to go on a vacation using money that she earned through her website – a trip that cost more than $3,000. Hers is an impressive success story, especially when she had so little hope to begin with. 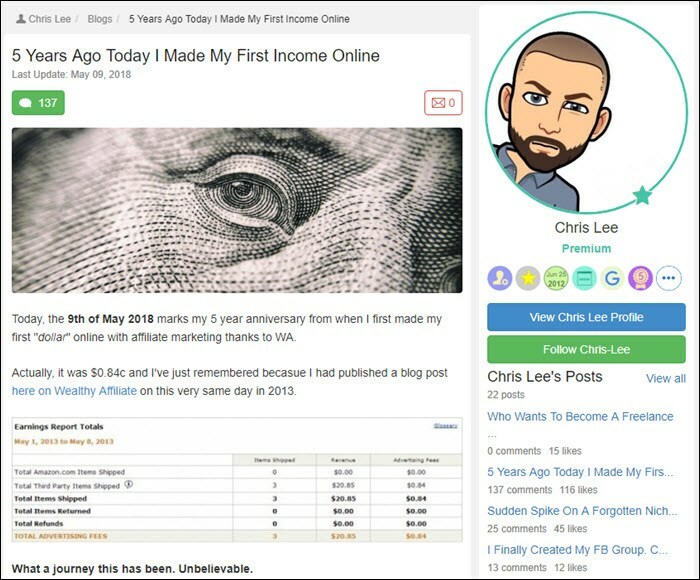 @Chris Lee is a long-time member of WA, earning his first affiliate income more than five years ago. He has seen considerable progress in that time and now works on three niche websites, along with an eCommerce site. He’s also been inching closer to the goal of 300 premium WA memberships in a year. As he explains, the income is a fantastic outcome, but that’s not the best part. Instead, he’s thrilled about the ability to be his own boss. That outcome isn’t a pipe dream. It’s one that various WA members do achieve. 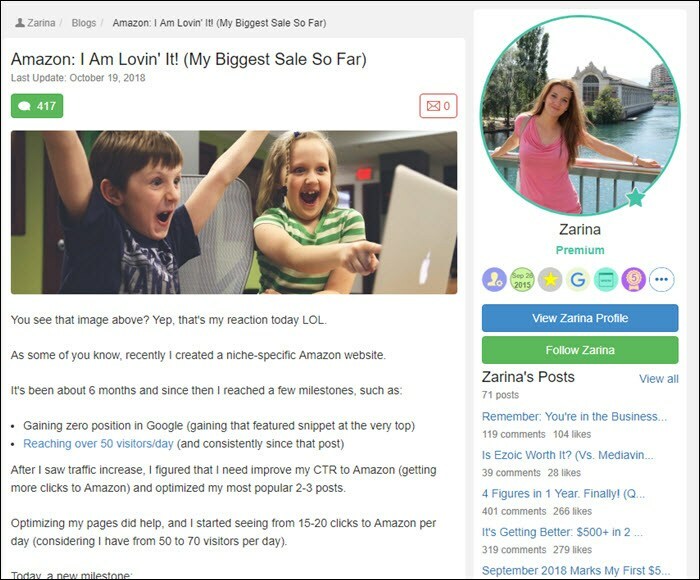 Six months before her post @Zarina had created a niche affiliate site. She has reached some significant milestones with the post, with a featured snippet in Google and more than 50 visitors per day. Her current success story highlights her biggest sale yet, a $570 tent. The sale netted her around $30 in commissions. That’s not all. The sale in question had nothing to do with her niche at all. This pattern often happens with Amazon, as their cookie doesn’t disappear immediately and Amazon is exceptional at selling products. So, even if you don’t convince people to buy the product that you’re promoting – you may end up selling something entirely different. 31. Just sold two sites for $9,000! 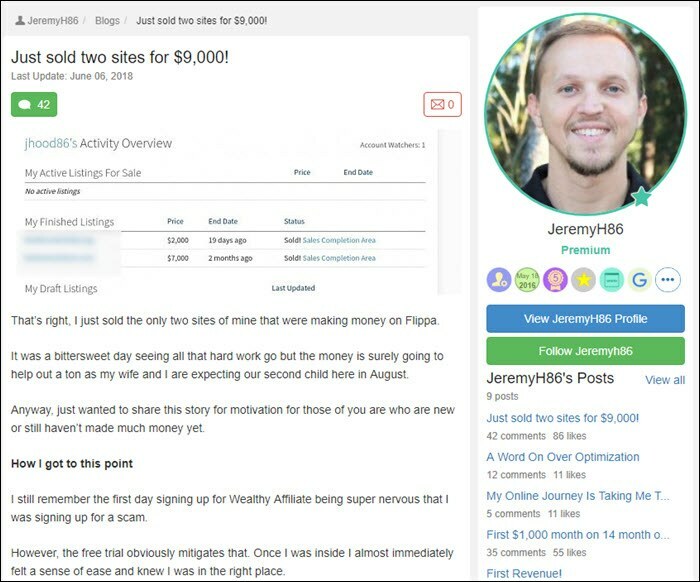 @JeremyH86 has found success in a different way, by selling his two income-making sites on Flippa. One of them sold for $2,000 and the other for an impressive $7,000. Both of the sites were relatively new, although they were receiving traffic and some income. For Jeremy, these sales mark the end of his niche site experience, at least for the moment. He has a new job opportunity to work towards and his earnings from the site sales are certain to come in handy. Jeremy states that he may end up owning his own sites again at some point, but he would probably focus on buying existing sites, rather than starting from the beginning. 32. Thanks to WA our companies are taking off! @Marshajenkin has taken advantage of WA in a different way. While she has built niche sites in the past, her current success comes from using the training and support at WA to build websites that support physical companies. The companies are ones that she and her husband run. One is a contracting company, while another involves the acquisition and management of properties. She posted in February 2018, a time that is normally slow for business. In this case, creating the websites through WA had made all of the difference. She has seen a couple of significant contracts, including one for $9,000. It’s an impressive outcome, especially as she can continue to build and develop the sites, along with her new niche site. 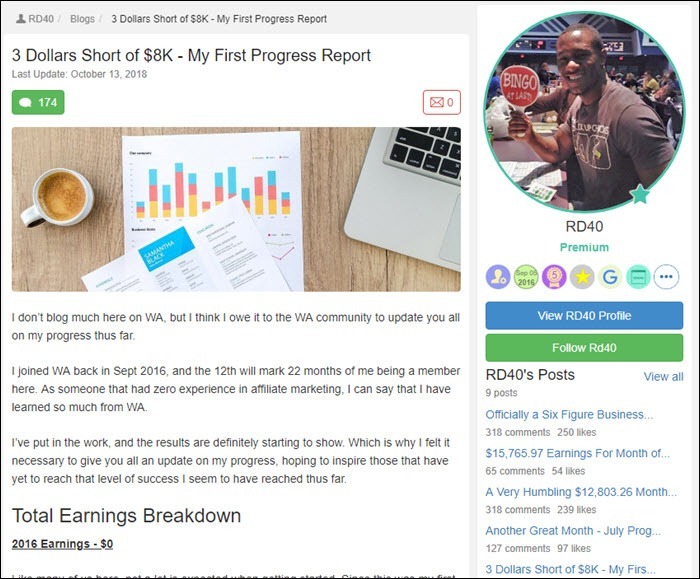 @RD40 has been a WA member since September 2016 and has been consistently building his business. Like many beginners, he made no income at all in his first year (2016). He saw a total of $329.84 for 2017. It wasn’t until 2018 that RD’s income really took off. He had earned $10,454.45 by June of 2018. An even more exciting aspect is that most of that success came from May and June. He earned $1,458.99 in May and then $8,940.00. It’s clear that those figures are just a sign of things to come. One of @MartyE’s biggest breakthroughs came from understanding the importance of focused traffic. He is in the unusual situation of owning a membership group with more than 37,000 members. While the group isn’t great to sell to, he was able to develop a paid membership option. By taking this approach, he’s been able to earn £651.45 annually. Other approaches might earn more, but that’s not the point. Marty’s approach is very passive and takes advantage of an audience that he couldn’t sell well to otherwise. Having multiple projects like this would be a good way to generate consistent meaningful income. 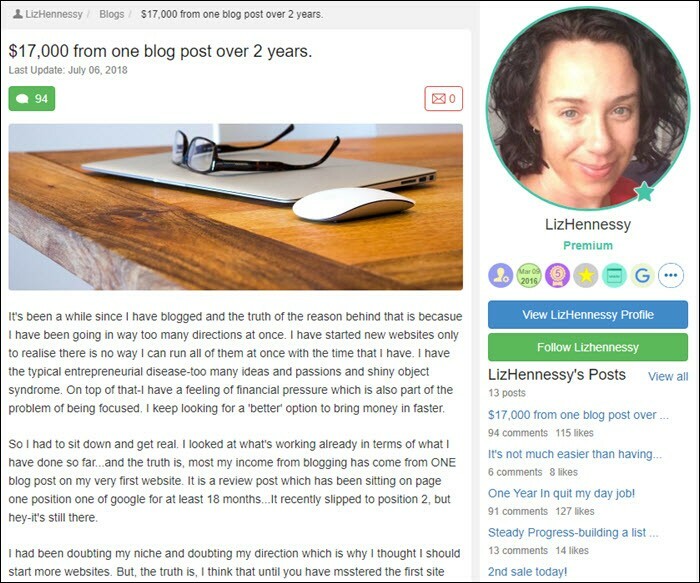 @LizHennessy highlights a pattern that many bloggers find themselves doing, where they are simply trying to do too many different angles all at once. Liz mentions the risk of doing so and how it is important to focus on what is working. In her case, she has one review post that performs particularly well. That post was in the first position for more than a year and is now in the second position in Google for the targeted keyword. The impressive thing is that she’s earned $17,000 from that post in the two years that it has been live. This is why it’s so important to keep writing content (especially reviews), even when it seems like you’re making little traction. You’ll never really know which posts are going to take off and become extremely popular. 36. 4.7K for the month of December and Setting My New Goals for 2019. It’s not surprising that @Debs66 is excited about her progress. 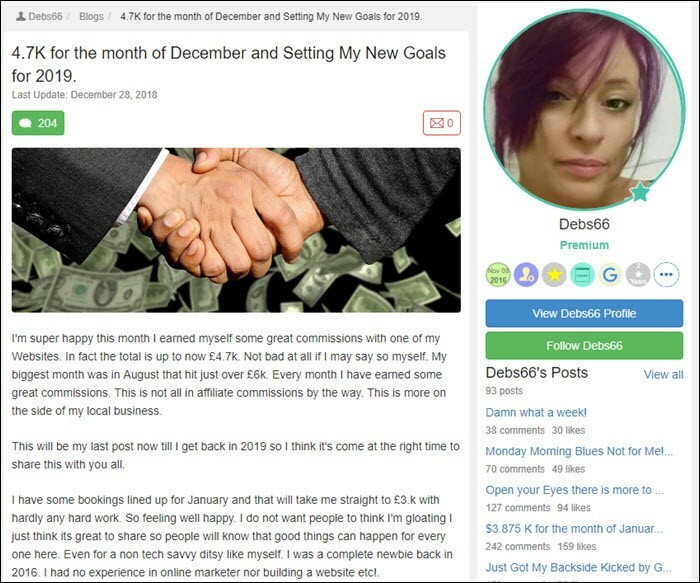 She earned more than £4,700 for the month of December 2018. That’s not even her highest monthly profit. She made just above £6,000 for August. Those totals partly came from affiliate marketing and partly from the local side of her business. Her success really is amazing. She started at WA in 2016, with no previous online marketing experience. She’d never even tried her hand at building a website before. She puts her success down to dedication. She simply refused to give up. 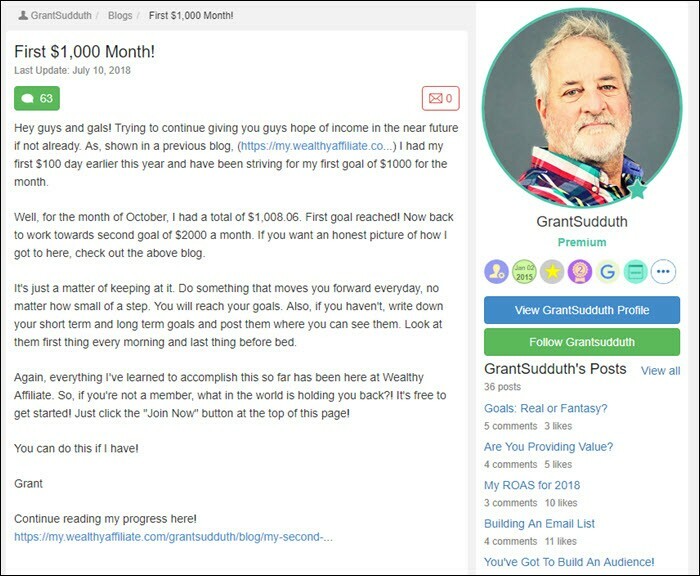 @GrantSudduth hit is first $100 commission day towards the end of 2017. It’s a powerful early goal, one that many people focus on. 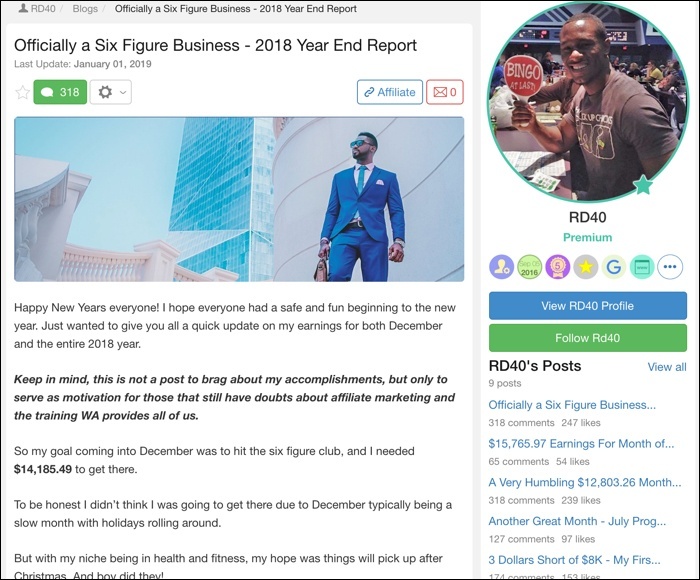 His current success post highlights another achievement – hitting more than $1,000 a month. His next goal is to reach $2,000 per month in income. Like many others, he says that the key technique is just ‘keeping at it’. He’s entirely right. Being consistent and working towards goals are key areas that successful affiliate marketers have in common. @MozMary focuses on the idea that success comes from keeping going in the right direction and having a good niche. She suggests that your niche should be one that allows you to be yourself while taking advantage of your skills. While it is possible to be successful in a niche you know nothing about, having a background in the topic certainly helps. 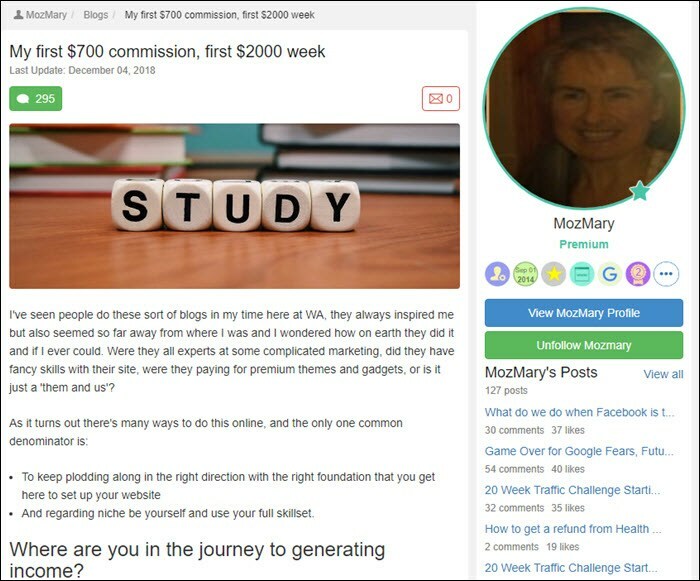 It’s clear that Mary knows what she’s talking about – as she’s recently hit his first $700 day, along with a $2,000 week. Both of those financial outcomes are impressive. They suggest that Mary is well on her way, with a business that’s going to grow further over time. 39. Influencer Success – Besting My Best! 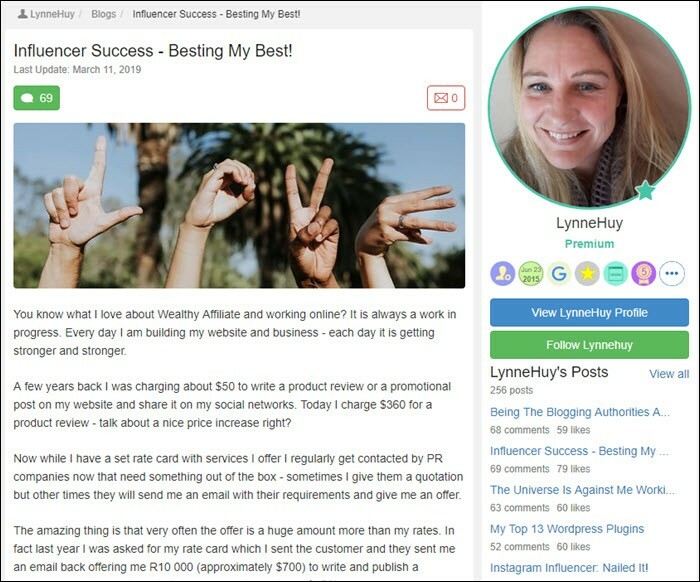 For @LynneHuy, WA has played a huge role in helping her to be successful as an influencer online. She was charging around $50 per post for her services just a few years ago. As of March 2019, she has been charging $360 for the same service. That’s not all. She will sometimes be contacted with offers, including one of $700 – for a task that took around 2.5 hours. How’s that for impressive? Like all WA members, Lynne started small and it took a while to see any success. Now, she keeps hitting success after success. There can be no doubt that her business will continue to grow. No doubt she’ll have even more amazing stories to tell in the future. 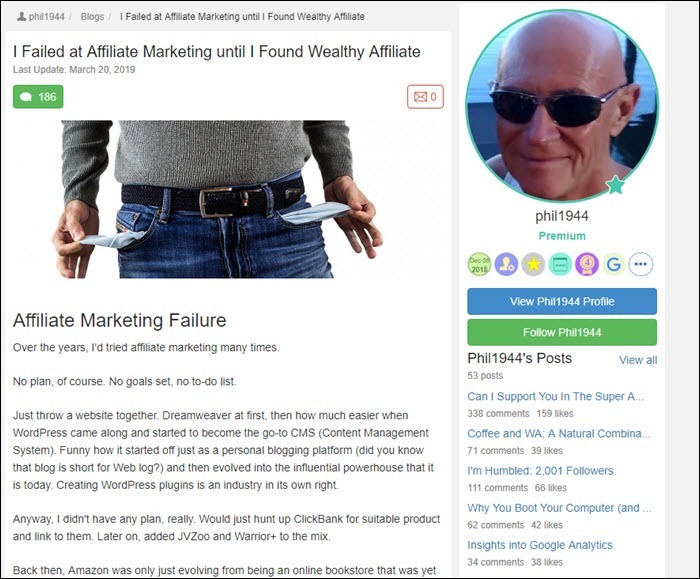 @Phil1944 tried affiliate marketing before he ever tried WA. He didn’t have any significant plan. Plus, the services that we rely on now were only just getting started. Finding WA was the solution that he needed. One of the most important aspects for Phil was how WA provides step-by-step information, teaching users the processes needed to make money online. 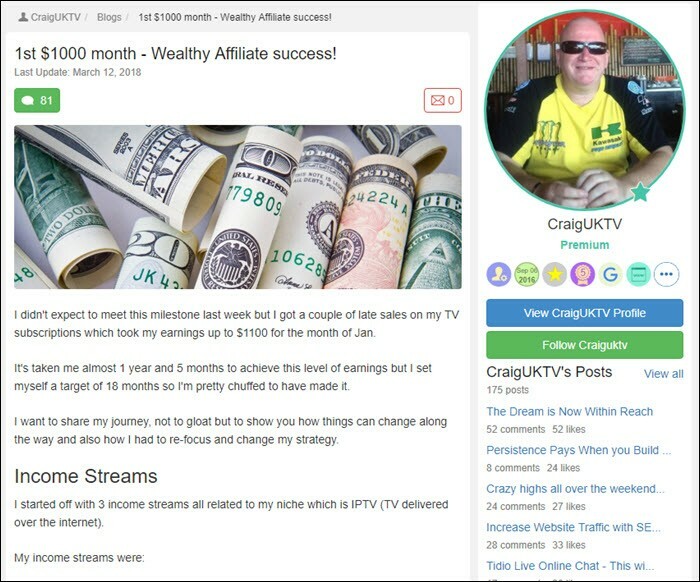 While Phil doesn’t talk much about his success, he does say that he has been seeing affiliate marketing success in just three months. He also mentions an affiliate program that he’s a part of. This program pays him $120 for a $65 sale. That’s beyond impressive. 41. 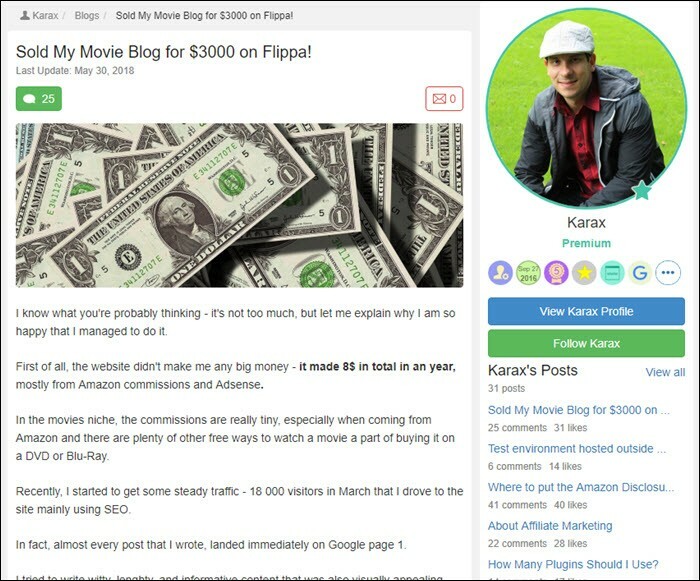 Sold My Movie Blog for $3,000 on Flippa! As @Karax mentions, a $3,000 website sale isn’t an incredible success story. While that’s true, the movie blog in question only made $8 in a year. One reason is that most of the commissions in the movie niche as small. After all, there are so many inexpensive ways to watch movies. Selling the site was part of @Karax’s decision to start making significant money online. The $3,000 will be a significant help in developing his own business. He also had fun with his movie site and learned a lot in the process. From his perspective, the experience was worth it and he came away fully satisfied. In @Marlinda1’s success story, she highlights the way that her Amazon Associates commission has grown over time. Her first deposit came in December 2017, for $10. She hadn’t seen any commissions before that time and Amazon had even closed her account. 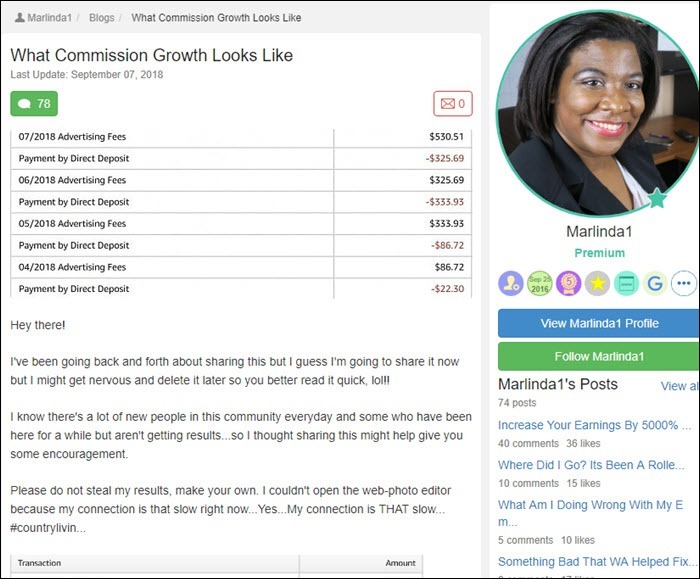 By May 2018, Marlind was earning more than $300 in commission per month. By July this was $530. This type of outcome is very common for affiliate marketing. It’s easy to quit when you are hardly getting any commissions but stick with it. As Marlinda’s experience shows, income will often jump unexpectedly. 43. $14,000 in 3 months. When @Saco started at WA, he aimed to be making $1,500 each month by the 1.5-year mark. He has more than surpassed that goal, making between $4,000 and $5,500 monthly by the same point in time. His site achieves somewhere from 25,000 to 30,000 visitors each month. Not only is @Saco seeing considerable success, but there is also plenty of growth on the horizon. His traffic and profits show that he knows what he is doing. He is also starting to look at email marketing. This should offer another income stream in the long-term, which is fantastic news. 44. How to Make Money with Wealthy Affiliate? A $150,000 Way! @OnlineBZDog has had an interesting experience with WA. His original goal was to develop a site to share experiences and help people with small businesses. However, the SEO techniques that he has learned through WA opened an entirely different door – one that led to a $150,000 contract. This happened through a personal contact, where a company appeared to have been severely hit by a Google update. @OnlineBZDog was able to determine that the SEO firm hired by the company had implemented some shady practices. He was able to use his WA account to show what had happened, then propose a contract to resolve the issues. 45. How An Old Disused Website Can Make Three Figures In A Week! Like many WA members, @Roybretton has multiple projects on the go. This includes some websites that he is actively promoting and others that he isn’t. One of the inactive sites has plenty of content but hasn’t had new content for roughly two years. Despite this, the site continues to make money every week. The niche is seasonal, so the income varies from week-to-week. Roy’s experience shows that it’s worth holding onto well-developed sites, even if you’re no longer working on them. You never know which sites will earn you passive income. You might also find, like Roy has, that it’s worth coming back to the site later on and growing it once more. @CLoney has a short and sweet story about her WA success. She has moved from $0 per month in Amazon sales up to more than $500 per month – within a two-month window. She links some of her success to suggestions from WA members, which included making her site more reader-friendly. I've been doing affiliate marketing for about a decade now. I started out in the VPN niche with my first successful website earning over $10k/month. I've since sold those websites, and started new ones. I don't like to share the revenue or specifics of One More Cup of Coffee just because haters will scream “It's only because you are in the Make Money Online niche”, or “the only people who make money are the ones selling the courses”. All of the awesome results you saw above are just a few that I've chosen to highlight here. There are many more. Back in 2017 I started tracking the stories I saw in my feed, and I've created individual “hubs” where you can go an investigate each story. Keep in mind, these are only the stories which are public. Many Wealthy Affiliate members choose not to share their results so they don't attract copycats. There's nothing wrong with that. You'll also notice quite a few members that have snowballed their success. For example, you may see someone in 2017 posting about their first Amazon sale, then in 2018 see their first $1,000 month, and in 2019 quit their job. So what do you think? Still skeptical? Totally convinced? Let us know in the comments.